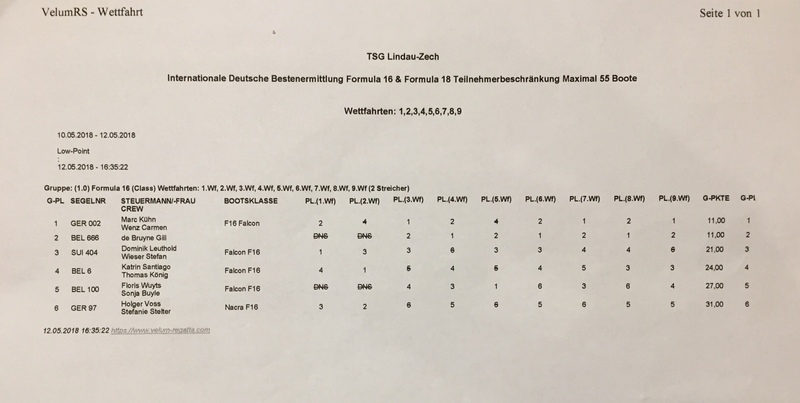 Formula16.de | Deutsche Formula16 Klassenvereinigung e.V. Zum Beginn der warmen Tage und mit den nahenden Osterfeiertagen im Blick haben wir für Euch den Regatta- und Trainingskalender 2019 finalisiert. direkt im Anschluss geht’s nach Ascona zur schweizer Meisterschaft um das Gelernte umzusetzten. Neben den deutschten Highlights am Walchensee, Bodensee und Ammersse steht hier die IDB am Ammersee beim Diessener Yachtclub im Fokus! Ein wirklich toller Club, schaut vorbei! Die EM am Lac de Maubuisson (südlich Bordeaux): Dieses Revier ist ein Traum, inmitten von sandigen Pinienwäldern wird auf Süsswasser mit feinster Meeresbrise gesegelt. Unbedingt mitmachen! Mit dem Rietli Cat-Battle auf der schweizer Seite des Bodensee nähert sich dann auch schon das Saisonende. Der Alpen-CUP (gesonderter Preis!) wird am Walchensee, Mattsee, Bodensee/Rietli ausgetragen werden. Also ran an die Poliermaschinen und das Boot über Ostern einsatzbereit gemacht. Bis bald in alter Frische! Aufgewacht liebe Seglerinnen und Segler! Ich hoffe, dass alle gut über den Winter gekommen sind und die Entzugserscheinungen des Katsegelns ausreichend mit Skifahren, Skitouren oder Flucht in den Süden kompensiert werden konnten . 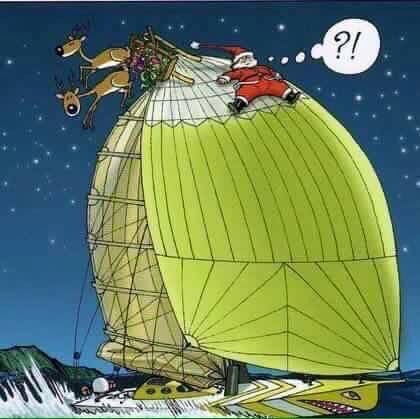 Seit morgens die Vögel wieder zwitschern und auch bei dem (zugegebenermaßen etwas heftigen) Winden in den letzten Tagen lässt sich wieder and Segeln denken. Vom 04.-06. Juni bieten wir mit tatkräftiger Unterstützung durch Gill von TheBoatshop.be wieder ein hochkarätiges Training in Domaso am Comersee. Auch wenn der Fokus auf Regatta-Performance liegt, jeder fängt mal klein an, so dass natürlich auch Umsteiger und Neueinsteiger in die F16 Klasse herzlich willkommen sind mit uns den feinen Wind am Comersee zu segeln. Die Community wird sicher auch diesmal bei gutem italienischem Essen nicht zu kurz kommen. Trainerin ist dieses Jahr Silvia Sicouri, ehemals F16 Seglerin und zuletzt für das italienische Nacra17 Olympiateam am Start. Uns erwarten knackige Kurzrennen, massig Starts, Videoanalyse und Nachbesprechung. Bei Interesse bitte hier über info@formula16.de oder direkt bei Gill gill.debruyne@gmail.com melden, die Plätze sind limitiert! Wir freuen uns auf ein gemeinsames Training mit Euch! ich hoffe Ihr hattet einen besinnlichen Weihnachtsabend im Kreis Eurer Lieben. Wie immer dürfte die Vorweihnachtszeit uns seit heute morgen vorkommen wie das abrupt gestoppte Hamsterrad. Wir finden nun, an den Feiertagen, Ruhe und Zeit das vergangene Jahr zu reflektieren, wenn wir nicht gerade (oder gerade weil?) verliebt das neue Segelequipment unter dem Weihnachtsbaum anschauen. An dieser Stelle steht nun oft der Jahresrückblick. Anstatt aber nun lang und breit über unsere wunderbar sonnige EM in Holland, die Nervenkitzel-IDB am Bodensee, das Mega-effiziente Training mit Mitch-Booth zu schwadronieren, lasst uns mit dem Bild aus dem vorherigen Absatz entspannt auf dem Sofa zurücklehnen. Lasst uns unsere ganz persönlichen Segelmomente reflektieren und mit unseren Partnern, Familien, Kindern und Freunden teilen, denn Freude und Glück teilen ist immer noch das Erfüllendste im Leben. In diesem Sinne wünsche ich Euch allen noch frohe Weihnachtsfeiertage und schon einmal einen guten Rutsch! Imagine the „official“ Youth boat was as fast as the „Olympic“ boat? Imagine 29ers were as fast as 49ers, Optis could train against Lasers and N15s could burn to the bottom mark at the same speed as Waterhouse and Darmanin. Eye rolling, iphone instagramming teenagers with ramp model skinny crews would be flocking to the yacht club and tearing the arse out of the creatine gorging gym beefcakes and pie noshing open class heavyweights no matter the conditions. Nobody would be safe. Juniors, old farts, olympic hopefuls, it would be open season with no age or weight restriction- YEEEEEEEEHA!!! But its not like that is it………………..
We F18 and F16 class sailors have been gifted the best boats in the world. And if you don’t like them you can change whatever is irritating you, the trampoline, the sails, the mast, the boards, the sheeting position, hell you can go build your own boat if you are that good. Ultimately you get exactly what suits you and it’s something to be proud of. Funny thing is, on any given day the boats all go about the same speed. But that’s a blog for another day. Back to our big news! My full crew weight with the young Jedi hopeful on board is 125 Kg – we are even too light for a Hobie 16! He wants to go as fast as the millennium falcon and be taken serious – yo! No amount of ballast, youtube, steroids or lead impregnated wetsuits can get us to F18 weight and strength. Although he talks like 50 cent, wins his beep test at school (I wondered if that was a swearing contest – subsequently I found out it is a fitness strength thingy) He just does not have the muscle or weight to handle the big dog, the king of the hill, the big kahuna, the F18. F18 – that’s where the fast dudes are, that’s where the big fleet is and where the wily old sea dogs that know stuff to make boats go faster than fast live. They hang out and splice their own ropes while picking up cars and other heavy stuff. Each grey hair and forearm vein a mark of a saved pitchpole. So while AS (Im sure there’s an S missing in that) lure and send our youth teams off on „Pathway boats“, far away from the salt blooded, suntanned wise men of the F18s they preclude the youth from the transfer of hard earned knowledge and practice against experienced racers. The wise F18 sea dogs know only too well what will happen if the enthusiastic, sparkly eyed two hulled riding youth and women are left alone. Cast adrift in a world of Optis, spirals and 470s while the real war rages mercilessly, without end in the F18 traveller series and state championships. They will be coerced onto boats with over inflated yardsticks. Overinflated yardsticks tend to help catalogue sales and Olympic bids……. till the truth comes out. When our young aspirational hopefuls pluck up the courage and venture out into open fleet against the yardstick toting hordes, they stand paralysed, wide eyed and quivering as they are smashed mercilessly to the bottom of the results page. They cannot hang on the coat tails of the seniors and thus learn nothing from them, castaways, left cold and alone on a one design shitbox. So, heres an idea said the wizards of two hulls while basking in their auras of speed. How about we make a baby F18? Something for the more nimble warrior. Something almost as fast as our steeds – we don’t want to get beaten by the fruit of our own loins after all. Something we can pick up and throw on the back of my fire breathing dragon when traversing the country looting and pillaging regatta silverware. Something that will keep the women and children close at hand so they can fetch me drinks and get off their Xbox. And I! Master of the flying hull assisted by my trusty comrade Tamer of the Spinnaker, can impart our hard won knowledge, piece by piece. Dueling, teaching and watching them develop exchanging blows around the race course. In this way, when the time comes, they too shall be feared warriors of the two hulled realm. A marvellous perfect storm of legacy rules for the F18’s, the taipan, new materials and design concepts brought about the birth of the Viper. A clever little Aussie that even with its diminutive size was nimble, light and strong enough to give the F18 a bloody nose. Now lighter warriors can get into the ring against the mighty F18. A boat that complies to F16, 104 in Europe and can be built at a reasonable price. “Reasonable” being subjective for many folks. BUT! compared to our carbon masted, Olympic, Mark VIXXVMCL Cat is cheap as chips! Thus the inner sanctum of F18nism in the fabled lands of NSW have struck the gavel and declared that skinny sailors, maidens, the meek and offspring will now be conscripted onto the real battle field. Invited to join the warriors on their F18s – head to head. On condition they come suitably armed with a Viper or F16 compliant warhorse. Silence befalls the audience as they try to digest the gravity of the situation. So while you sit open mouthed, stunned as your biscuit drops into the tea, I’ll give it to you in bullet points. 1. F16s are now invited to join the F18 traveller series. One BIG start, a charge down the hill shouting wild eyed. 2. F16 wont score against the F18s or be eligible for F18 silverware, but they will be in the scuffle from the first trow odf the gauntlet. 3. The F Catamaran fleet just got bigger, the fight tougher, the comradery stepped up a notch. 4. Expect smack talking teenagers and bikini clad goddesses in the rigging areas. We have a fleet that caters for a much wider demographic now. Shure, the new guys won’t win the arm wrestling or tug o war. 5. 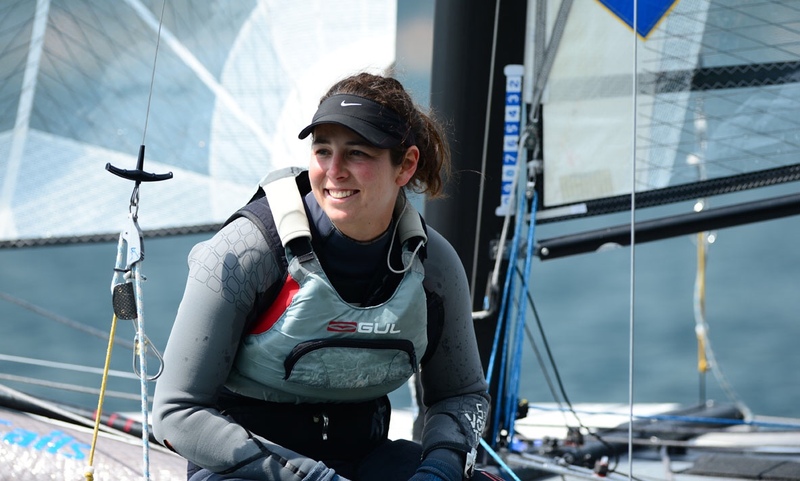 The F Class catamaran sailors are going to remain the fastest cat sailors in the country – why? – because we have the biggest most competitive fleet and the best boats. 6. F16 and F18 are the perfect combination to years of sailing enjoyment, great regattas and rapid skills improvement. What are you umming about?? So, if you were wondering what class to enter, which boat to buy for you, your kid, your girlfriend, your boyfriend (it’s a brave world). If you feel the NEEED FOR SPEEED!!!! Pull your finger out your Australian Sailing, get an F-class catamaran F16 or F18 whichever suits you. Dust off the old juggernaut. Rig the kite and come blasting at the NSW traveller series. YEEEEEEEHAAAAAAA MOFOS see you at the Speers Point Cattagatta! In diesem Sinne erfolgreiches Einwintern! Für diejenigen, die bereits auf die Saison 2019 schielen: die IDB wird voraussichtlich am 25.5/26.5 am Walchensee stattfinden, die Termine für die Syndikat stehen ebenfalls fest: 6.7/7.7 beim DSC. Die weiteren Termine findet Ihr demnächst auf der internationalen Website im Kalender. As all of you know the Dutch F16 Class Organisation together with Catamaran Sailing Club Hellecat are very happy to host and organise the Europeans F16 in 2018! After the decision was made during the Europeans F16 in Morges we began to make a plan and we are working to make it a very special week for all competitors! This event will take place from 21st till 27th of July on the beautiful ‚Haringvliet‘ lake. We hope to see all F16 sailors, friends and family to come over to join us during this event. Registration will open in the coming weeks. Attached you find our flyer. Please inform your nations sailors of the event! nach dem Katpokal Bodensee und der IDB fanden sich die dort teilnehmenden F16 in ähnlicher Besetzung bis Montagabend in Domaso am Comersee erneut ein. Von Dienstag bis Donnerstag wurde dann unter Anleitung des x-fachen Teilnehmers an Weltmeisterschaften (Tornado und F18) und an Olympia, Mitch Booth, ein Training für Regattaambitionierte abgehalten. Bei zunächst ungewöhnliche starkem Südwind wurden Bootsbeherrschung an der Startlinie, korrektes Starten und Manöveroptimierung geübt und anschließend ausführlich und unter Zuhilfenahme von Videomaterial besprochen und analysiert. Mitch schaffte es auf beeindruckende Art die Sachverhalte verständlich und mit dem nötigen Hintergrundverständnis zu vermitteln. Während einige Teilnehmer bereits am Donnerstag Abend Richtung Ascona zur Schweizer F16 Meisterschaft aufbrachen, gingen 5 Boote nochmals aufs Wasser um in wunderbarem Wind von Domaso bis Bellano zu segeln und dabei das Gelernte nochmals zu verinnerlichen. Mitch zeigt Tricks für das korrekte Wenden. Nach einem grandiosen Katpokal Bodensee wurde nur 4 Tage später, ebenfalls beim TSG-Zech die kombinierte IDB der F16 und F18 angeschossen. Mit einem separaten Start, das 5-Minutensignal der F16 war während aller 9(!) Wettfahrten das Startsignal der F18, konnten die 6 teilnehmenden F16 an der Startlinie entspannt bleiben, sogar ein Steuerbordstart war erfolgreich möglich. Während donnerstags zunächst noch bei teilweise bewölktem Himmel und bis 20 Knoten Wind aus Nordost gesegelt wurde, war die zweite und letzte Wettfahrt des Tages ein Leichtwindnervenkitzel. Der Freitag wurde dann der Traumtag mit blauem Himmel, Sonne und um 10 Knoten aus West und bescherte den Teilnehmen 5 tolle Wettfahrten. Der Samstag stand windtechnisch zunächst dem Freitag in nichts nach, die letzte Wettfahrt mit den dringend benötigten Streichern wurde dann noch gerade so vor dem Einschlafen des Windes beendet. 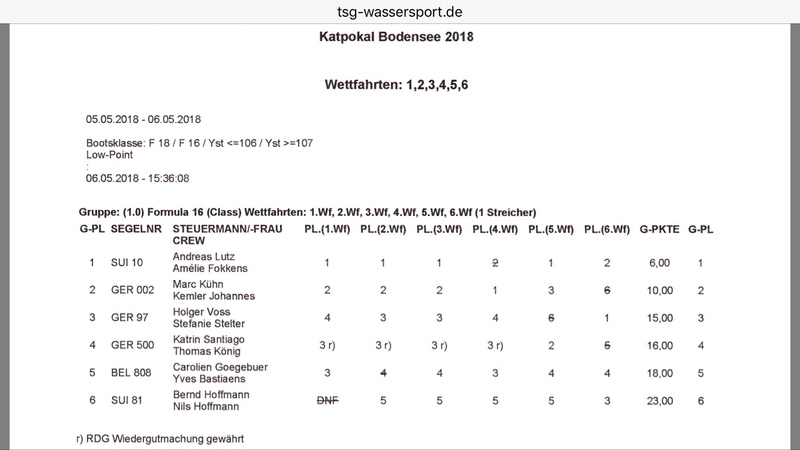 In der Topgruppe ging es zwischen dem belgischen Solosegler Gill de Bruyen und dem deutschen Team und Titelverteidiger Kühn/Wenz, dicht gefolgt vom Schweizer Team Leuthold/Wieser heiß her und es herrschte selbst am Freitag bis zum letzten Rennen Punktegleichstand! Aber auch das norddeutsche Team Voss/Stelter und das zweite belgische Team Wuyts/Buyle lieferten sich spannende Matches die das ein oder andere Mal auch durch die Entscheidung für die richtige Seite des Kurses entschieden wurden! Der TSG Zech schaffte es sich selbst zu übertreffen und bot den Seglern nicht nur auf dem Wasser ein sensationelles Programm in der gewohnt entspannten und beeindruckenden Atmosphäre des östlichen Bodensees mit den verschneiten Alpen in Sichtweite. Alleine das morgendliche Auslaufen mit der fantastischen Kulisse machte die Teilnahme absolut lohnenswert. Wir hoffen, dass wir mit diesem Konzept, das familienfreundlich und terminlich günstig auch für die weit Angereisten aufgestellt wurde, künftig noch mehr F16 Segler für IDB und Regatten insgesamt zu begeistern. Es zeigt sich zudem zum wiederholten Mal, dass das Konzept mit den F18 zu regattieren und gemeinsame Events zu veranstalten, aufgeht: für die F16 Segler die auch F18 segeln und Mitglied der F18 KV sind war die Community gewährt, die JHV konnte besucht werden. Zudem kann so der Nachwuchs auf F16 in der gleichen Regatta starten und wer weiß, so bereits für eine steile Karriere in den größeren Klassen vorbereitet werden. Mal wieder aussichtsloser Versuch, den ewigen Sieger bei den 16’er Regatten aufzuhalten. Souverän gewinnt Andi Lutz mit Crew Amélie Fokkens mal wieder den Lindauer Katpokal vor Marc Kühn und Gastschotten Johannes Kemler. Bei karibischen Verhältnissen und immer mehr als 10 Knoten waren sechs F16 neben knapp 20 F18 und einer Yardstick Gruppe auf der Bahn unterwegs. Sonntag hatte Andi bei Irgendwas zwischen Flaute und Leichtwind dann wieder die eingebaute Wünschelrute an Bord, die ihn zielsicher mit Schleichfahrt vor den anderen 16′ über den Kurs navigierte. Die Binnenmannschaft Steffi Stelter und Holger Voss wurden Dritte. Katrin Santiago und Tom König wurden am Samstag während des ersten Laufs Opfer eines Regelverstoßes am Gate, der eine unfreiwillige Patenthalse und Kenterung zur Folge hatte. Das nachfolgende Boot konnte nicht mehr ausweichen und schlitzte mit dem Schwert das Segel von GER 500 auf. Mit geflicktem Tuch konnte das Boot erst am Sonntag wieder mitsegeln. Am Donnerstag trifft man sich wieder, diesmal zur IDB. Die gute Nachricht: Andi segelt F18. Dieses Jahr ist in der Tat vieles anders: so eine warmes (um nicht zu sagen heißes) Ansegeln im April hat es selten gegeben. Ist denn alles früher dran dieses Jahr?? Um das zu beurteilen meldet Ihr am Besten gleich zur großen Kat-Regatta Woche in Lindau-Zech: bereits in zwei Wochen geht es gleich zu Beginn der Saison los (also früher ;)) mit Bodensee-Katpokal und F16 IDB innerhalb einer Woche! Die Boote können stehen gelassen werden zum Spasssegeln, oder ihr macht die Woche am Bodensee mit Sightseeing, Radtour oder was Euch sonst beliebt voll. Bereuen werdet ihr das auf keinen Fall, nur wenn ihr nicht dabei wart, dann verpasst ihr was! Das TSG Team um Gerd Schmitzer legt sich dieses Jahr ganz besonders für Euch ins Zeug, seid gespannt! Goodall Design hat bekanntgegeben, das Charterboote für die F16 Euro in Holland verfügbar sind. Da das Kontingent sicherlich knapp ist, solltet Ihr ggf. schnell reservieren. Unterstützt uns mit einer Spende! Wir stellen als e.V. eine Spendenbescheinigung aus. SKINS Kompressionsbekleidung sponsert die MItglieder der F16 KV!